I am a sucker for nice surprises, like Sting making a cameo appearance at the Grateful Dead’s 1993 Vegas show, or Iron Chef giving me fancy chocolate when it’s not my birthday or anniversary … Or finding out that Garden City, Idaho is the somewhat unlikely home to some amazing wine tasting. Garden City has always been Boise’s seedy 2nd cousin. It’s the go-to place for used RV’s, adult book stores, and bloody Mary’s at The Ranch Club. This last factoid turned out to be very beneficial to Kitty B. who had started the morning with the pretty little dress she’d been wearing the night before AND the mark of shame — double X’s on her hands to indicate she’d been bounced from the bar we’d frequented the previous evening. The Ranch Club and its frisky stallion are conveniently located next door to the Syringa Winery. Syringa Winery is next door to the Ranch Club and its frisky stallion on the roof, and a little deeper down Chinden Boulevard is the highly acclaimed Cinder Winery. Once we had gotten past a few minor concerns (will will be shanked in the parking lot? ), we were ready to start our off-the-beaten path wine tasting excursion. Mike Crowley, Syringa owner and winemaker, hails from Podunk. Bonus! Happily enough, Syringa wine maker Mike Crowley hails from Podunk proper, so he showed us some down home hospitality before, during, and after tasting. Mike has been crowd pleasing with his wines, particularly his Primitivo. But his newly released blend of cab, merlot, Syrah, and Primitivo shows off not only the Snake River Valley’s suitability for growing great fruit, but also Crowley’s skill as a winemaker. Go Podunk! Cinder Winery enjoys a hot reputation that has only been enhanced by Sunset Magazine fawning over the style of winemaker Melanie Krause. Cinder’s dry and off-dry Viognier vintage 2011 netted gold medals in the mag’s 2012 international wine competition, so if you happen to have a bottle, consider yourself lucky. Cinder’s Syrah is deep and sophisticated, on the pricey side for Podunk ($28 and up) and in demand enough you often have to clobber competing buyers like you are at Walmart on the Friday after Thanksgiving fighting over 2- for-1 Chicken-in-a-Biscuits. Instead, I opted for their dry rosé and Cinder’s 2nd label (read affordable) Laissez Faire. Billed as red table wine, the blend is a great way to enjoy the winemaking prowess of Krause, and save some extra dough to buy another Ranch Club Bloody Mary if you happen to need one. 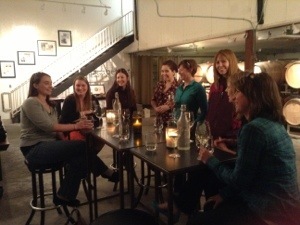 The tasting room is warehouse chic and the staff super knowledgeable. 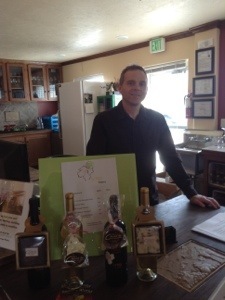 Better yet, both Syringa and Cinder share space with other wineries. Even though I find it difficult to agree that Garden City is the new BoDo, I do have to admire the vision of these wineries. To change the look and feel of a neighborhood, some brave soul has to go first. They might be on to something…and in the meantime, you can see some really interesting movies once you’ve made the journey down Chinden.